Upon arrival in Strasbourg, check into a double or twin Classic room at 5* Regent Petite France, an exclusive hotel boasting a flawless level of service, situated in the heart of the historic city centre. 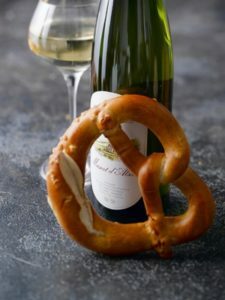 After settling in and freshening up, a tutored tasting session of three Alsace wines will take place in a chic local wine bar, accompanied by a platter of local cheeses and meats. 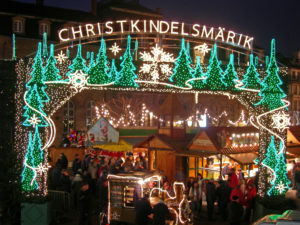 Today, the morning will be free to explore the oldest and most historic of Christmas markets! Strasbourg’s Christkindelsmärik dates back to the 16thCentury and has thousands of people flocking to the ‘home of Christmas’ each year! This spectacular market features over 300 small wooden chalets, offering local products and delicacies. You’ll be able to nibble on gingerbread and sip hot mulled wine, whilst wandering around the various squares of Strasbourg discovering what made this market ‘Europe’s Best Christmas Market’ in 2014 as voted by Europe Best Vacation. Each year, a different guest country is welcomed to promote their goods, making the market a true multi-cultural delight. After a morning of festive enjoyment, you will be met by an English speaking specialist driver/guide, and accompanied throughout the afternoon on a private discovery of the Alsace Wine Route. You will have the opportunity to visit two ‘caveaus’ (the local name for wineries), and at each estate you will be welcomed for a full tour of the estate and cellars, followed by a tasting session of the wines produced here. You will be taken back to Strasbourg at the end of the day, in time to freshen up before dinner. In the evening, a delicious four course dinner with a Cremant and a local Riesling will be served in a traditional Alsatian winstub. After breakfast, you will be met by an English speaking specialist driver/guide, and accompanied throughout the day. 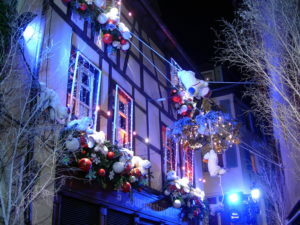 Today will focus on more of the incredible Christmas markets in Alsace. In a pretty, fairy-tale setting, the fully pedestrianised streets of Colmar lend themselves perfectly to a typical festive market. The quaint illuminated town welcomes you to explore their five different market areas including a Children’s market in Little Venice (look out for the children’s choirs singing carols on brightly lit boats on the canals! ), the markets of the Place de l’Ancienne Douane, and Alsatian gastronomic delights at the food markets at Place Jeanne d’Arc. A Christmas ice skating rink at Place Rapp finishes off this spectacular market, where you can enjoy the childlike joy experienced from skating in such a dream-like setting! Your guide will introduce you to the various areas of the markets, and you will then have some free time to explore independently if desired. There will be free time in Colmar for lunch; your guide will be pleased to recommend a suitable restaurant, or you may prefer to taste a variety of the culinary delights on offer from the market stalls! In the afternoon, you will drive through quaint villages where small local Christmas markets will be taking place, and you will have the opportunity to stop at these and browse, revelling in the festive atmosphere. 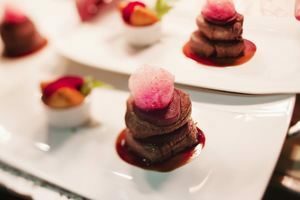 In the evening, a five course gastronomic food and wine pairing dinner will be served in the Michelin-starred restaurant, Le 1741, which is within walking distance of the hotel. The expert sommelier will specifically pair your chosen dishes to a local wine. After a leisurely breakfast, check out of the hotel, at at your own pace commence your return journey. The total price of this package is dependent on your dates of travel and has been based on 2 people travelling together and sharing a double/twin Classic room at 5* Regent Petite France. The package includes 3 nights’ bed and breakfast accommodation, a full and half day private guided and transported tour, tours and tastings at 2 wineries, a wine bar tasting session, a Winstub dinner with drinks, and a Michelin starred wine pairing dinner.